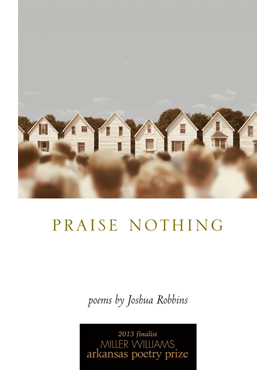 In Praise Nothing, Joshua Robbins writes from a suburban landscape of strip mall bars and vacant lots in which addicts and itinerant preachers, hymns and the turnpike’s whine are all made to confess, to testify to the hard truths of faith and doubt in middle-class America. In this arresting and finely crafted debut collection, readers travel a via negativa of sidewalk weeds and patched asphalt that meanders past cheap motels and laundromats, trailer parks, and corner churches to a place where a truant God aimlessly and endlessly drives the neighborhood, where birds sing their “fevered hymn / over the dusty tract house roofs” and even the “gravel-throated hallelujahs of dumpsters” profess that “no one is looking for the infinite.” Populated with figures as diverse as Janis Joplin, Ronald Reagan, the Big Bopper, and Søren Kierkegaard, these poems are wrought by reverence and skepticism. Praise Nothing navigates the religious, the political, and the sublime. In the lyric tradition of Gerard Manley Hopkins’s Terrible Sonnets and James Wright’s odes to the Midwest, Robbins’s compassionate poems sing of our broken connection to the transcendent. Robbins shows us that if there is anything left to praise, it is Nothing. Joshua Robbins is a lecturer in English at the University of Tennessee. His poetry has been published in Third Coast, Copper Nickel, Mid-American Review, Best New Poets 2009, and elsewhere.